The M65 jacket is an iconic jacket, anyone who has seen a Vietnam film or indeed any war film that features the US army has seen one. Sylvester Stallone wore on in the first Rambo movie, Robert De Niro wore one in the classic film taxi driver, the M65 jacket is a piece of military, fashion and cultural history. Despite this I have never seen one in the flesh until I was sent the Mean and Green M65 Infantry Jacket. The M65 Infantry jacket is exclusive to Mean and Green, you won’t find it anywhere else; it has been produced to replace their bestselling M65 regiment jacket. The M65 Infantry jacket is a true four season jacket. It has a quilted fleece liner (made from 100% polyester) which can be zipped into the outer jacket for use during autumn or winter or it can be removed and the outer jacket used on its own as a lighter weight spring or summer jacket. 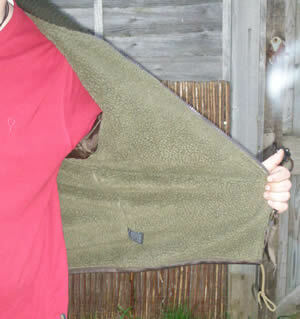 The quilted liner can be worn as an independent jacket however due to how it is secured into the outer layer you do have to zip it from the inside. The outer jacket is jammed full of well thought out features, some clearly inspired by the original M65 jacket and others that are completely unique to the Mean and Green M65 Infantry Jacket. The M65 Infantry Jacket features distressed stitching to give it a vintage appearance, it also has faded Sgt Stripes and an old style embroidered name tape saying M&G '65, all adding to its vintage army surplus appearance. These features are unobtrusive but subtly add to the look and appearance. It also has an antique style silver zip which is in keeping with the vintage feel. That’s the fashion talk talked, now for the pockets! The M65 Infantry jacket has two chest pockets with bellows which allow them to hold much more than you expect yet still remain sleek and not look overloaded. These chest pockets are fastened with poppers to keep everything inside. Further down the M65 Infantry jacket has two large hip pockets allowing yet more storage of essential items. These pockets also have popper closures to keep everything securely stored. The carrying capacity of these four pockets is a lot more than you may expect. Without listing the various items I carry around on a daily basis (it’s all essential honest!) I can assure you that unless you intend to carry all your kit for a weekend in your jacket you will not be disappointed. The M65 Infantry Jacket also features two side access hand warmer pockets located behind the hip pockets, these are surprisingly cosy and ideal for those of us who aren’t natural glove wearers. Luckily I have also had some good weather to test the jacket as a lighter summer jacket as well. The M65 Infantry jacket works very well as a summer jacket I am pleased to report. The 100% cotton material offers good wind resistance and it looks smart enough for day to day wear. Just because it looks smart don’t be misled that this is just a fashion jacket, it is at home in the woods as it is on the high street. Something I forgot to mention is that the M65 Infantry jacket has a cotton hood hidden in the collar; it offers good resistance from the wind and some protection from the rain. If I had to find faults with the M65 Infantry jacket I could only find these - the M65 Infantry jacket is not waterproof, it is shower proof but you don’t want to be wearing it in a torrential downpour. This is easily resolved by carrying a lightweight rain jacket, or treating it with something like Wet Blocker Spray. The other minor complaint I have is that the hand warmer pockets are located directly behind the hip pockets - if you have (as I do) a large pocket kit collection you may find you feel the hip pockets contents when using the hand warmer pockets. As I said this is only a minor grumble. The M65 Infantry jacket does come up a little large so if you are used to wearing a large you may well be better off considering a medium (personally this pleases me no end as I can say I still fit in medium clothing). The M65 Infantry Jacket has been my go to jacket for the last few months and I have every reason to expect it to continue to be for many years to come. It ticks all the boxes for me, vintage style, comfortable, hard wearing, warm, multifunctional and presentable in almost every situation. Take my advice, buy one, you will not regret it. 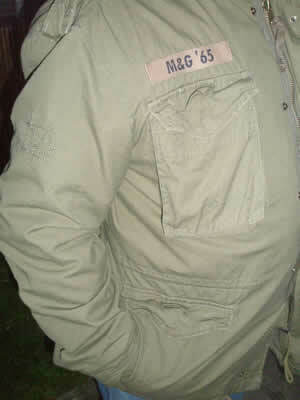 You can buy the M65 Infantry Jacket directly from this site.